Description: Erect herb, 2–6 cm high, glandular-hairy with red stems. Leaves obovate to elliptic, 3–6 mm long, 1–3 mm wide, glandular-hairy; shortly petiolate. Flowers in terminal corymbs or racemes or sometimes solitary. 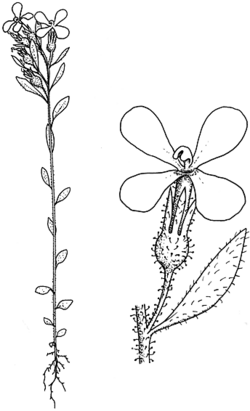 Sepals linear, 1–2 mm long, about twice as long as the inferior ovary. Corolla 2–3 mm long, whitish with a yellowish throat. Column rather short, flattened at the summit with the anthers are borne on the side, pale with a yellowish apex. Inferior ovary globose, glandular-hairy; stigma 2-lobed, 1 produced before the other. Capsule globose, 1–2 mm long, glandular-hairy. Distribution and occurrence: Widespread, favouring damp ground; chiefly in inland districts south from Narrabri.